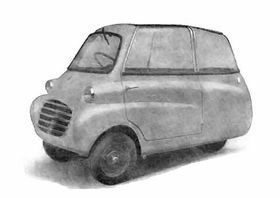 The ISSI SpA Microbe was a microcar in a tricycle or three wheeler format, produced in only two models from the (Istituto Scientifico Sperimentale Industriale) (ISSI), located in Milan, via Ugo Bassi number 21. Note that it was a prototype and there is very information. From 1953 - 1954 ISSI designed and build a three wheeled microcar (one wheel at the rear and two in front) with a single cylinder engine two-stroke air cooled engine with a bore of 56.5 mm and stroke of 50 mm and displacement of 125 cc by Idroflex, which was placed in the rear. The small car was launched at the Turin Motor Show in April 1953 with the name Microbe. It had two seats (the passenger was in the back seat in tandem behind the driver), an aluminum body, a plexiglass roof, with a total weight of only 159 kg (349.8 pounds). Other features of the microcar was the Dallorto carburetor, 3 gears plus reverse, tubular chassis, 12 Volts electrical system, small 3.50 x 10 tires , step 145 cm, tread (front) 86 cm. Although the power was minimum (6 HP limited at 5000 rpm) the Microbe could reach 70 km/h (43.5 mph). Fuel consumption was quoted to be 38 km with a liter of fuel, while the suggested retail price was around 390,000 lire (624.00 USD). Observe that the first unit built - one on display at the Salone di Torino show - was characterized by soft lines, and if you may may, aerodynamic, and the second small car built, which was to foreshadow the version to be produced in series, had a slightly modified front and looked particularly much more angular. Particularly striking was the closed bodywork around the cabin. Launched as a Covered Scooter, theMicrobe was to be a great means of essential transport for doctors, engineers, salesmen, travelers and generally for those who wanted an inexpensively car for their business. At the end of 1953 the Microbo disappeared from the market.